6 Quart Capacity: this is the perfect size for a single person, a couple or a small family. 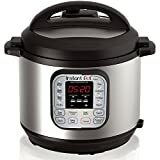 Functions: browning, sautéing and simmering functions make the food prepared in this pressure cooker even more appealing and tasty. Proven Company: the T-fal company has been a recognized leader in cooking appliances 60 years. Safety Mechanisms: the pressure cooker has lid seals when the unit is pressurized and does not unseal until pressure is released. Recipes: the abundance of recipes and information on the internet about this pressure cooker from Chef Emeril, helps the user know how to use the unit and what food to prepare. The Emeril by T-fal CY4000 Electric Pressure Cooker offers easy and quick one-pot cooking. You can brown, sauté and simmer—all in the same non-stick pressure cooking pot. ​The Emeril electric pressure cooker is simple to use. Place the ingredients inside the cook pot, and then set the time and temperature for the dish you are preparing. That’s it! When your dish has finished cooking, the cooker automatically keeps the dish warm until you are ready to serve. And when it is time to clean up, you can place the cooking pot in the dishwasher. ​The T-fal CY4000 is attractively designed. A large LED timer on the front of the stainless steel outer shell displays the time from the moment the pot is pressurized, until cooking time is complete. There are three pre-set cooking modes— brown, simmer and sauté. The pressure cooker is also safe. It has a lid that heretically seals when pressurized and cannot be opened until the pressure is released. ​The Emeril 6 quart, Electric Pressure Cooker comes with a steam basket, a 1-year limited warranty and a book of 75 recipes from celebrity Chef Emeril. ​If you have never cooked with a pressure cooker before, Chef Emeril is the perfect ambassador. Several video productions available on the internet show Emeril advertising this model of cooking and providing step-by-step instruction on how to produce appetizing meals. ​There are many advantages to cooking with a pressure cooker. Food cooked in the pressure cooker is ready in 1/3 the time as compare to faster food prepared by conventional methods. Frozen food can be placed into the pressure cooker without defrosting. Frozen chicken wings can be ready to eat in 12 minutes. A whole chicken can be fully cooked in 30 minutes. The best advantage of a pressure cooker, however, is the taste of the food! Pressure cooking seals in flavor and nutrients of the food you prepare. Inexpensive meats become tender and succulent. There is also a steamer included with the Emeril Pressure Cooker that can be used for vegetables, seafood, and fajitas. The thing I like best about cooking with the pressure cooker is that I can get nutritious, tasty meals ready in very little time. When I come home from work, my teenagers are hungry. I can take meat right out of the freezer, put in in the pressure cooker, and by the time I have cooked the vegetables and made a salad, the meat is finished. Dinner is cooked in half an hour or less. And the meals are good. The Emeril cooker does all the browning, simmering and sautéing for me. And the cooker can be washed in the dishwasher. ​For me, the difference between an electric cooker and the stove top model is the sense of ease I have when using it. The old stove top pressure cooker I had was noisy. It made me nervous. I was afraid that it would explode! This electric model is quiet. It also is safe. It is impossible to open the lid if there is pressure inside. I’m confident enough to let my kids use it, too. The Emeril by T-fal CY4000 6 Quart Electric Pressure Cooker offers excellent one-pot cooking features—including browning, sautéing, and simmering. The unit also has a warming feature and a steamer basket. It is easy to use and Emeril’s recipes encourage even the novice owner to try his ideas. The only concern about this product is the non-stick cooking pot. Teflon products are being phased out of production because of health concerns. It would be preferable if this cooking pot were stainless steel. Also the Teflon has been reported easy to scratch and blister. Easy to use, with many great cooking functions, the Emeril is a simple, safe pressure cooker for those who don’t mind the Teflon cooking pot. I have a T-fal electric pressure cooker. I think I have figured out how to pressure cook in it, but the instructions are horrible for anything else. I would especially like to know how to use the browning function. I can find no info about this appliance in particular anywhere. Please assist me. Thank you for your time. Where do I find a part for my electric pressure cooker? I am looking for the small gasket where the sealing cover is at. I used it three times with great success cooking; however, the last time the coating bubbled and washed right off with a soft cloth cleaning it. I hope to find a replacement pot for it. Three uses them peel? Really? Stainless steel would, indeed, be wonderful! I’ve had my Emeril Pressure Cooker in 2011. It quit sealing about 4 years later. Can I buy a new seal for this?